ROSLYN HEIGHTS. Visually distinctive and embracing prominent exterior architectural elements, this impressive, new construction, stone-and-brick six-bedroom, five-and-a-half-bath Colonial stands regally on an oversized corner property in the congenial community of Roslyn Country Club, aptly named for its neatly manicured properties, towering trees and proximity to Wheatley Hills Golf Course. Across the street from the park-like grounds of the Royalton Mansion, this exceptional home was built by Napoleon Development, one of the North Shore’s preeminent custom-home developers, and provides access to beaches, boating, golfing, fine and casual dining, the Americana Mall, and a comfortable 45-minute commute to Manhattan via train and highway. Surrounded by nearly a half-acre, this majestic masterpiece features beautifully landscaped lawns enfolding a large circular driveway, attached 2 car garage with parking area, and an expansive rear patio with generous covered porch and built-in wood-burning fireplace. The masterfully designed and exquisitely finished interior boasts up-to-the-minute finishes with sun-drenched and airy rooms, high ceilings, five-inch red-oak and Italian-porcelain floors, elegant moldings/trim package, an elevator, state-of-the-art designer baths, and easy flowing layout which will facilitate gracious entertaining. 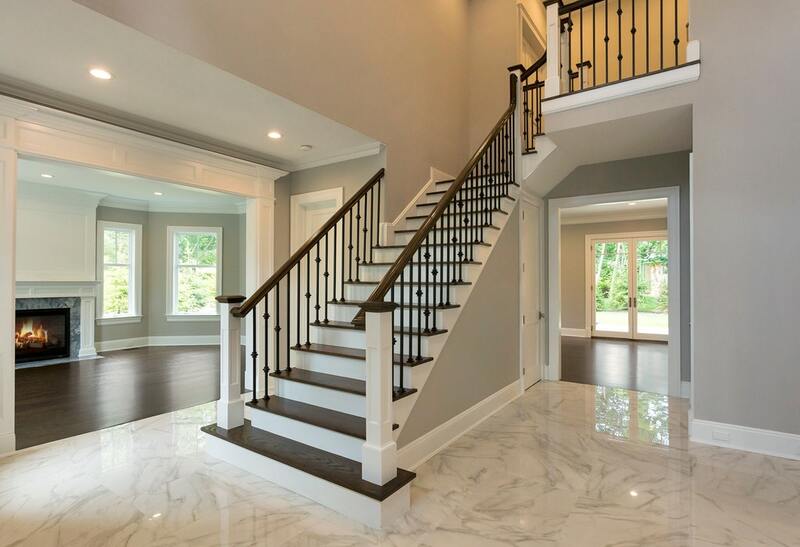 A striking modern take on ancient English custom doors opens up to a breathtaking two-story, center-hall foyer with gleaming heated porcelain floors, a grand staircase with elegant iron balustrade, and a lovely powder room with a waterfall countertop. 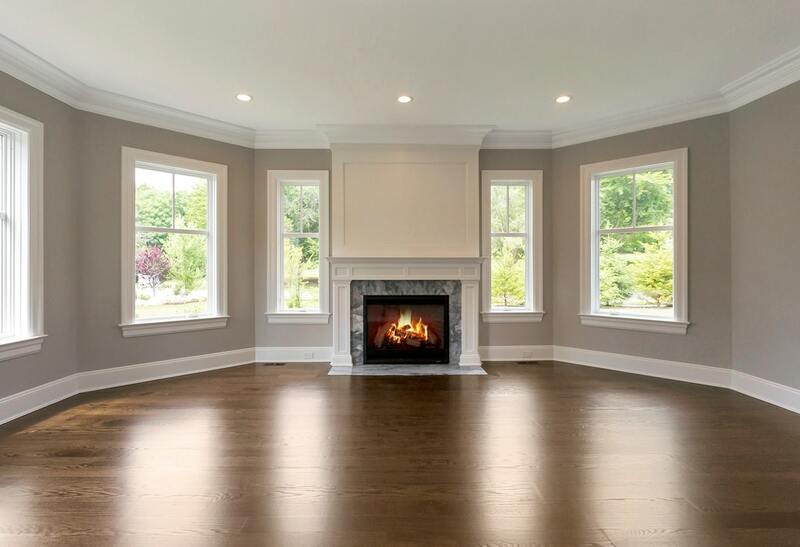 The unique octagonal living room features a gorgeous marble gas fireplace and many large windows. The formal dining room sets the stage for elegant dining with an oversized, arched triple Marvin window, shoulder-height wainscoting, and a striking coffered ceiling. Open to the living room and kitchen, the bright and spacious great room is flooded with sunny vistas through a large bay window and two sets of atrium doors opening to the rear bluestone patio. With white shaker custom cabinetry reaching up to the high ceiling’s crown molding, the spectacular porcelain-and-Quartzite cook’s kitchen features ample storage and workspace, including a contrasting bi-level center island with seating area, sink, dishwasher, storage and microwave oven. 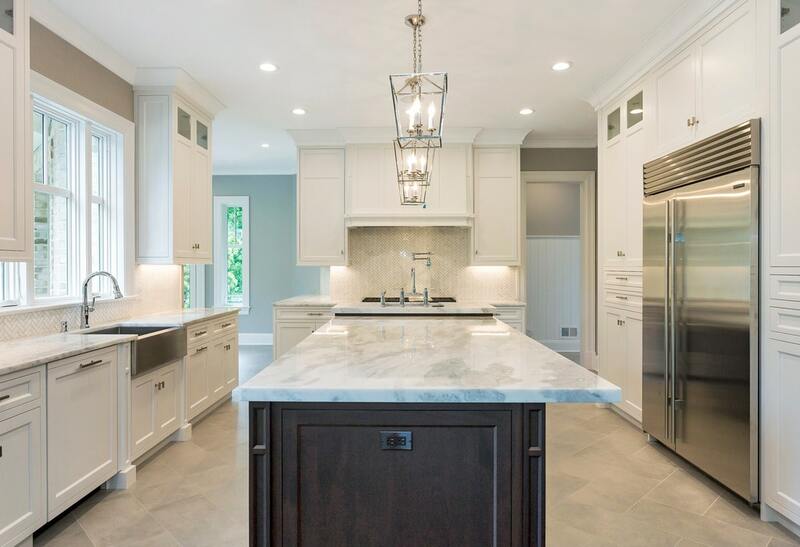 Additional high-end appliances include a Wolf six-burner, double-oven gas range with pot filler, an integrated Bosch dishwasher next to a farm sink, and a side-by-side over-size Subzero refrigerator built into a wall of cabinetry. Off the kitchen is a sunny breakfast room with access to the verandah; access to the dining room via a butler’s pantry with walk-in pantry, and a hall leading to the garage with side entrance, laundry room, full bath, and study/bedroom. 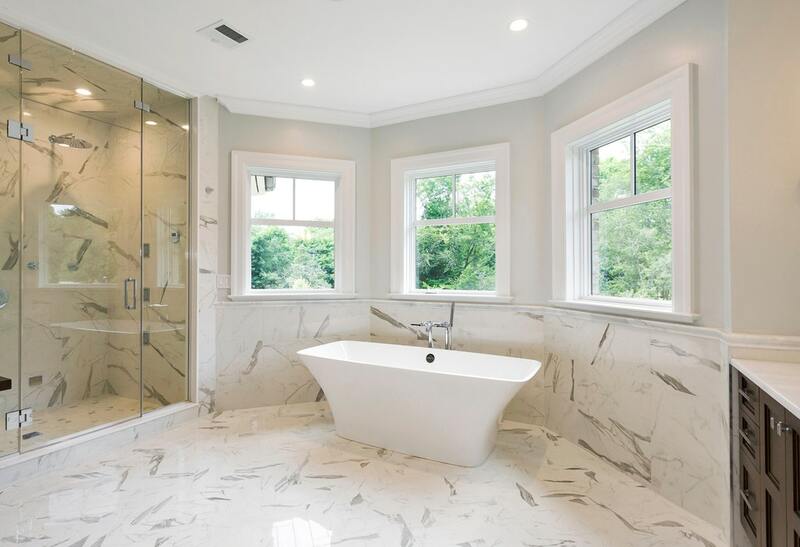 On the second floor, a spacious and sunny master suite enjoys a huge custom-fitted walk-in closet and a luxurious Quartzite master bath with free-standing tub, large frameless-glass steam shower, and oversize vanity with double sink. Also, on this level are two bedrooms with baths en suite, two bedrooms sharing a Jack-and-Jill bath, and a laundry room. 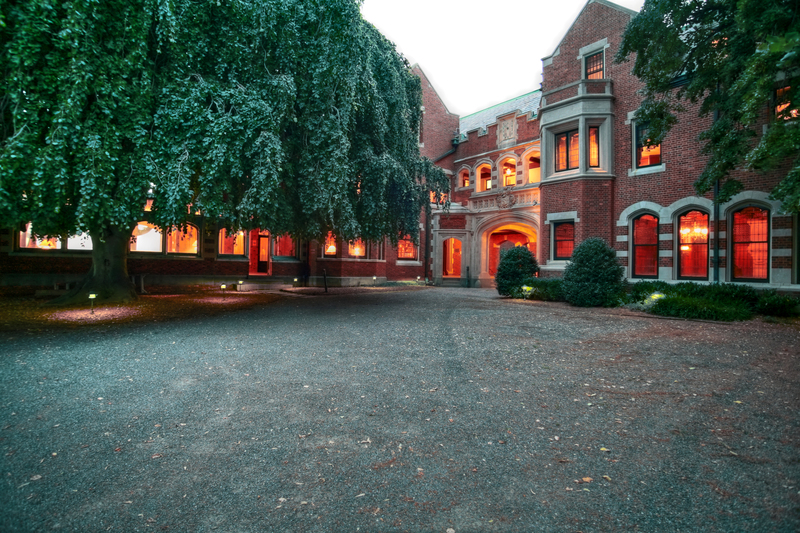 A full basement, with ten-foot ceilings and access to the verandah, offers ample space for future expansion. Come experience this magnificent, creative and aesthetically pleasing new home, and you will truly feel that this home is your castle. 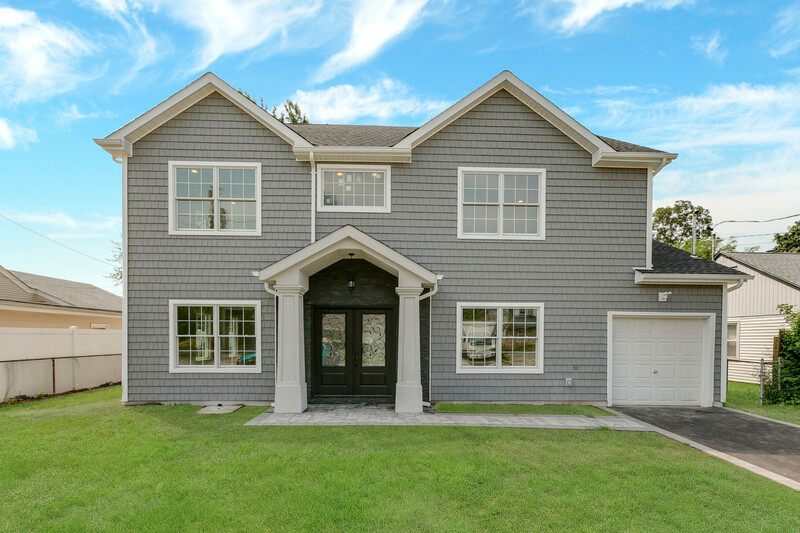 For more information on this distinctive Colonial in Roslyn Country Club, click here. 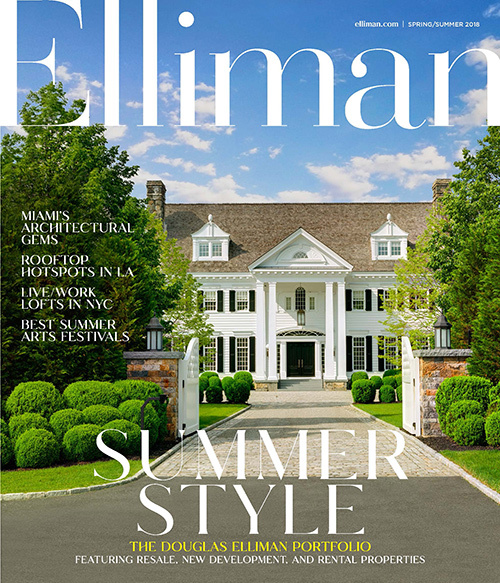 The Spring/Summer Edition of Elliman Magazine is here!